2017 Job Hunting Intentions & Recruitment Channels – Part II Why people moved. 2017 Job Hunting Intentions and Recruitment Channels – Part II Why people moved. 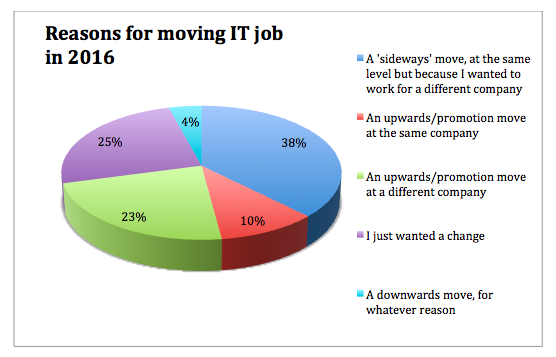 Our last blog looked at the results of our research* into 2016/17 job movement intentions, specifically whether respondents had moved in 2016 and whether they intended to move in 2017. The general picture was that more people were sitting tight last year and fewer were intending to move in 2017 (although of course they can change their minds!). The rough proportions of people moving in last year’s study (in 2015) and this year’s (in 2016) are broadly similar. For a sideways move to a different company, the respective percentages are 33% (2015) and 38% (2016). For an upwards/promotion move at the same company these figures are 12% and 10%, and for the same move but at a different company they are 19% and 23%. For those who ‘just wanted a change’, there was a slight decline from 31% to 25%. However, it’s significant – for both recruiters and their clients – that so many people, a quarter of last year’s respondents, move jobs simply for a change of scene. Assuming, as we must, that our respondents are being truthful, this suggests that a very substantial amount of recruitment is done for reasons that are difficult to pin down. It could be they don’t like their current employer, or their boss, or they simply feel they’ve been there long enough, but many people clearly do move simply to feel some new water under their keel. Moreover, as was also the case in our last year’s report on these stats, while very few move for a lesser salary, the figures from 2016 suggest that a lot of people do want a change of employer rather than staying at their current place to get a promotion (only 10% did the latter in 2016). 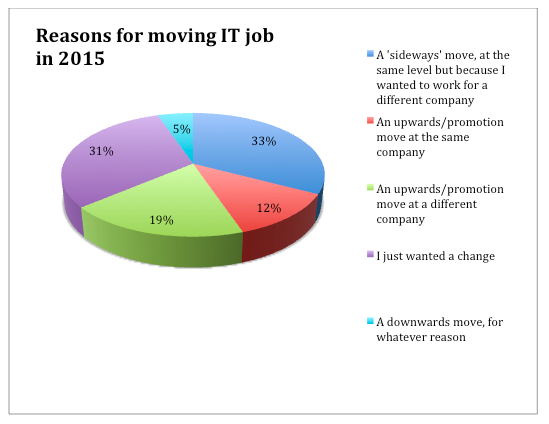 Some 61% of our respondents to this question had changed company either for a promotion or in a ‘sideways’ move. When you add in the 25% who simply want a move, that also suggests to me that retention schemes need to work harder. It’s significant that when I checked what I’d written about this part of our research last year, I concluded, “these figures ought to be a wake-up call to HR teams and line managers to get out amongst their colleagues and create the most favourable working environments they can – otherwise, when we repeat this next year, a lot more people will have found some greener grass outside the confines of their current workplace.” Things do not appear to have changed! 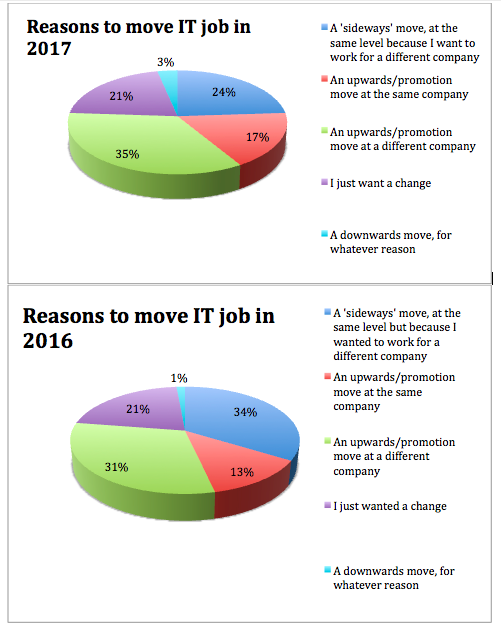 The main reasons for moving in 2016 are shown on the pie-chart below and then again below that for 2015. We also asked people what were their reasons for wanting to move job in 2017. Once again, there are some interesting comparisons to be made between this year’s results and last year’s. The most obvious similarity between 2016 and 2017 in the reasons given for wanting to move in the future is that the percentage who ‘just want a change’ is the same (21%) in each year. There are also a lot of people who are happy enough to move ‘sideways’, so long as it’s to another employer. That said, the percentage who would move for these reasons has fallen lot, from 34% in 2016 to 24% in 2017. * This research was carried out by thePotentMix, an independent third party, using Be-IT’s database of candidates, our consultants’ extensive Linkedin contacts, a SurveyMonkey and a complementary social media campaign.